The International Campaign to Abolish Nuclear Weapons, which spearheaded a landmark nuclear disarmament treaty, was awarded the Nobel Peace Prize. The significance of this award cannot be underestimated. Their hair fell out in large clumps, their wounds secreted extreme amounts of pus, and their gums swelled and bled. Purple spots appeared on their bodies, signs of hemorrhaging beneath the skin. Infections ravaged their internal organs. Within a few days of the onset of symptoms, many people lost consciousness, mumbled deliriously and died in extreme pain; others languished for weeks before either dying or slowly recovering. In the face of Trump’s nuclear threats, the danger the world faces is immeasurable. On July 7, more than 120 countries approved the UN Treaty on the Prohibition of Nuclear Weapons, which requires ratifying countries “never under any circumstances to develop, test, produce, manufacture, otherwise acquire, possess or stockpile nuclear weapons or other nuclear explosive devices.” The treaty also prohibits the transfer of, use of, or threat to use nuclear weapons or nuclear explosive devices. Fifty-three countries officially signed the treaty, and three have already ratified it, which makes them parties to the accord. Ninety days after 50 countries ratify it, the treaty will enter into force. However, the five original nuclear-armed countries — the United States, Britain, France, Russia and China — boycotted the treaty negotiations and the voting. North Korea, Israel, Pakistan and India, which also have nuclear weapons, refrained from participating in the final vote as well. In October 2016, during negotiations, North Korea had voted for the treaty. Meanwhile, Trump is moving the world closer to nuclear war, threatening North Korea with destruction and attempting to blow up the nuclear deal with Iran. The day before the new treaty was concluded, Trump threatened to “totally destroy” North Korea if it attacked; that amounted to a threat to commit genocide. The Iran deal is embodied in the 2015 Joint Comprehensive Plan of Action (JCPOA). It rescinded the punishing US and international sanctions on Iran, amounting to billions of dollars of relief. In return, Iran agreed to curtail its nuclear program. Under the US Iran Nuclear Agreement Review Act, the president must determine every 90 days whether Iran remains in compliance with the JCPOA and whether it still serves US interests. The next 90-day period ends on October 15. 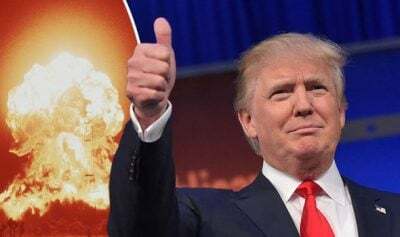 Trump will reportedly refuse to certify that Iran is compliant with the agreement on October 12, in spite of the UN International Atomic Energy Agency’s finding that Iran is in compliance. If Trump refuses to certify that Iran is compliant with the JCPOA or determines the agreement is not in the national interest, Congress will then have 60 days to act. If Congress reimposes sanctions, it would likely cause the JCPOA to unravel. Iran would then proceed with a program to develop nuclear weapons. The White House has signaled that Trump will urge Congress not to reimpose sanctions, but rather hopes Congress will pass new legislation beyond the scope of the original deal. “If Congress complies, such unilateral action to change a multilateral agreement will effective kill it,” Wendy Sherman, former under secretary of state for political affairs and US lead negotiator for the JCPOA, wrote in The New York Times. Moreover, if Trump’s actions scuttle the Iran deal, it will send a dangerous message to North Korea that the United States cannot be trusted to abide by its multilateral agreements. Both Trump’s threats against North Korea and his undermining of the JCPOA could lead to nuclear war. But the nuclear powers have ignored that decision. And in spite of UN Security Council Resolution 687, which established a weapons-of mass-destruction-free zone in the Middle East, Israel maintains a formidable nuclear arsenal. Indeed, Trump is planning a $1 trillion rebuilding of the US nuclear weapons program. The United States is the only country ever to use nuclear weapons. On the day of the Hiroshima bombing, 19-year-old Shinji Mikamo was on the roof of his house helping his father prepare it for demolition when he saw a huge fireball coming at him. He heard a deafening explosion and felt a searing pain throughout his body. It felt as if boiling water had been poured over him. His chest and right arm were totally burned. Pieces of his flesh fell from his body like ragged clothing. The pain was unbearable. Shinji was three-quarters of a mile from the epicenter of the bomb. He survived, but most of his family perished. Shinji’s daughter, Dr. Akiko Mikamo, author of Rising From the Ashes: A True Story of Survival and Forgiveness, told a Veterans for Peace Convention that 99 percent of those who were outdoors at the time of the blast died immediately or within 48 hours. This should serve as a cautionary note to Trump — and Congress — that there is no trifling with nuclear weapons. Secretary of Defense James Mattis and Secretary of State Rex Tillerson are reportedly counseling Trump to certify that Iran is complying with the JCPOA. But Trump has consistently criticized the Iran deal, probably because it was concluded on Barack Obama‘s watch and Israel is dead set against it. In any event, Trump is playing with fire — nuclear fire — in both North Korea and Iran. We must pressure the White House and Congress members alike, and hope that cooler heads prevail. The stakes are unbearably high.